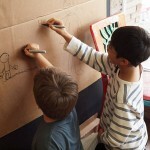 Visit YIA Gallery this Spring to explore a world inspired by kids’ creativity! 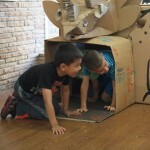 Walk through a cardboard jungle or crawl through a dinosaur maze, all incorporating drawings, paintings and sculptures from the 2014-15 Walker Rezaian Creative HeArts Kindergarten Arts Program at Bahia Vista school in San Rafael. 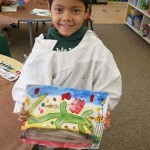 Find out how these young artists explored ideas about friendship and emotion through the visual arts. Regular hours 10 a.m.-4 p.m., Monday-Friday. Open the weekend of May 2-3, noon-4 pm, for Marin Open Studios. 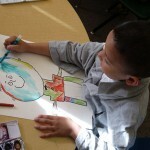 The Walker Rezaian Creative HeArts Kindergarten Arts Program was created through a partnership between Youth in Arts and the Walker Rezaian Creative HeArts Fund, celebrating 5-year-old Walker Rezaian’s life and love for art. 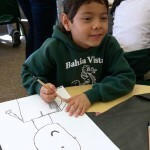 The Fund has provided all Bahia Vista kindergartners this year with professional instruction in the visual arts, along with workshops for parents and teachers. Bahia Vista was selected for this program through a competitive application process. Click here for information about applying for the 2015-16 academic year.